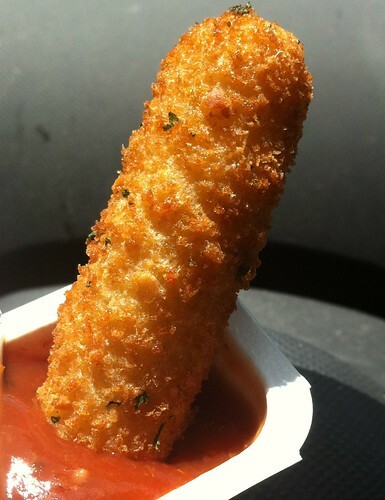 I don’t even really like cheesesticks but after going to Sonic the other day, I might have to change my mind. It was during their “happy hour” (when the sodas are affordable….unlike the rest of the day) and I noticed I could get two cheesticks for a dollar. Sounded reasonable. What I got was a perfectly crisp…crunchy outside..and some melting…stringy…gooey…goodness that was the mozz cheese inside. These were very hot-n-fresh tasting. Perfect afternoon snack to go with my Cherry Limeade. Good marinara sauce there on the side as well. Did NOT expect to like these at all. Totally surprised and almost shocked how good these were. Hope I haven’t jinxed myself now…and the next time I get the greasy-soggy-and-sucky-version. I’ll keep ya posted.